Serbia, while a small country, has produced many outstanding tennis players. Jelena Jankovic and Ana Ivanovic both reached the top of the WTA rankings. Novak Djokovic is considered one of the best tennis players of all time. His replacement as the next Serbian tennis star could be eight year old Mihailo Topic. Topic is sponsored by Novak Djokovic, and regularly trains on the clay courts at the Novak Tennis Center in Belgrade. Djokovic’s investment is happening as Serbia struggles to find potential tennis stars in a declining pool of talent. Topic initially appeared on the radar by hitting with Djokovic’s old coach Marian Vajda. Vajda was impressed with Topic’s technique, and predicted big things in the future for him. Djokovic practiced with Topic the following day, and a few more times before reaching a sponsorship agreement. The head coach of the Serbian Tennis Federation, Dragan Serer, says that Topic’s skill level is a few years ahead of his age group. Serer believes that the comparisons to Djokovic are fair, but everyone should wait until Topic regularly starts to play tournaments. Topic trains five days per week for two hours. He likely won’t start playing tournaments until he is 10. Topic’s coach Pavle Bulic says that Topic is smart and already has a feel for the game that older players do not have. Topic’s potential is heightened by the fact that he appears to genuinely love tennis. Topic’s coach has to pull him off the court so that he won’t burn out. Topic is constantly watching tennis and going over potential trophy celebrations in the future. While Serbia has produced great players, the number of tennis players in the country has declined steadily over the last few years. 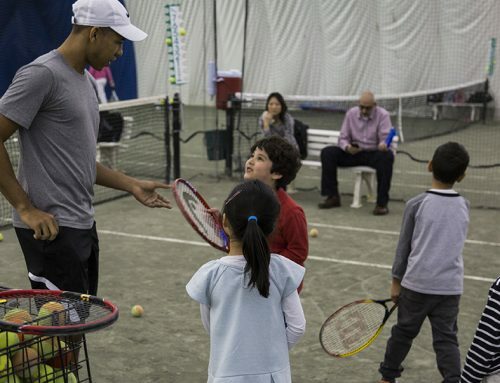 Serer believes that fewer kids are playing in local tennis clinics. Serer also thinks that the economic difficulties in Serbia are a factor, as parents try to influence their children to play less expensive sports. Djokovic is covering Topic’s coaching, equipment, and fees. The overall cost can add up to nearly half of the average income for a family in Serbia. The Serbian Tennis Foundation primarily offers financial support to their top juniors every year. Topic’s father has given up his job in order to meet the demands of Mihailo’s tennis and school schedule. Topic’s father would prefer if Mihailo played a team sport where he wouldn’t face such individual pressure. However, Topic’s father is committed to seeing how far his son can go in the tennis world.